Tuition for toddlers – necessary or over the top? As his tutor flashed one flashcard after another to him, little Gabriel Tan glanced longingly towards the door. A sharp look from his mother put him back in focus, and he obediently repeated the words on the flashcards. “Can I go to the playground now, mummy?” asked the little boy hopefully. “No, you have to do your memory exercises next,” said his tutor, pre-empting the mother's reply, and the boy’s face fell again. Gabriel is only three years old, but he has been receiving hour-long tuition lessons three times a week after his nursery classes so that he can “keep up” when his mother finally enrolls him at the coveted primary school she is an alumnus of – Nanyang Primary. “I don’t think he is very smart, so to make up for that, he has extra tuition after nursery to build up his memory and vocabulary,” said his mother, who only wanted to be known as Mrs Tan, 37. “Most of my friends also send their toddlers for after-school tuition, because it’s just so competitive these days. Better he suffer now than later,” she said. Mrs Tan pays a “toddler tutor” $90 for each session with Gabriel. In return, he has promised that Gabriel will be able to read and write fluently in both English and Chinese by the time he starts primary school in three years’ time. Each hour-long session includes memory games, Chinese flash-cards activities, worksheets and basic abacus so that he can start doing simple Mathematics mental sums soon. On top of home tuition classes and nursery, Gabriel also attends piano classes and takes tapdancing lessons. Mrs Tan estimates that she spends about $3,000 a month on enrichment classes and school for her youngest son. His tutor, Mr C K Chan, 35, was previously a primary school teacher and told Yahoo Singapore that he has over 40 current young pupils ranging from as young as two to as “old” as six and has been tutoring toddlers for about four years. A quick search of “preschool tuition in Singapore” yields multiple results on home tutors or tuition centres alike extolling the virtues of pre-school tuition and how necessary it is starting from just two years old. “Preschool home tuition is very important… more about teaching children to have a love of learning and a drive to succeed,” explains one such website. Cheaper on the low-end than that for older kids, home tuition for pre-schoolers ranges from about $30 to $120 an hour depending on the experience of the tutor and the size of each group of young students. “Start your preparation early and raise a gifted child,” reads another pre-school home tutor advertisement. Yahoo Singapore spoke to ten sets of parents, asking them if they would be open to the idea of sending their toddler for tuition classes as young as two. Five pairs said they would if they felt that their child was “falling behind". “I work full time and I have no time to teach my child after work because she is usually already sleepy by the time I reach home,” said bank executive Sandy Low, 36, whose four-year-old daughter attends Kumon enrichment classes on top of her regular Kindergarten. “I worry if I am burdening her too much but then I think if she can’t keep up in Primary School she might blame me for not sending her for the same kind of classes. She’s very competitive," she explained. “This sounds like rubbish and exploitation of guilty parents to me,” said housewife Melanie Rodrigues, 36, who has three children aged 2, 5 and 11. 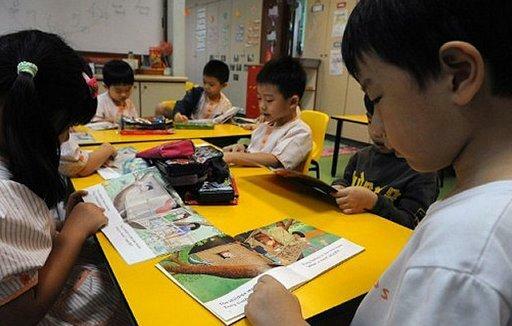 Primary school teacher H Q Teo, 28, told Yahoo Singapore that it is “depressing” to see that many of the P1 students she teaches are already used to having tuition instead of having fun after school. “I ask my class what plans they have after school, and I would say about half tell me that they have enrichment or tuition classes to attend. After one exhausting day at school, they still have to go for classes and then do their homework at night,” said Teo. “Their parents keep asking me if they need extra classes, extra homework, and I always tell them no. Poor things," she said.